Opening Reception: Vernissage Thursday, September 22nd from 6PM to 9PM, Festival Hall, Navy Pier. PATRON is proud to announce a presentation of Samuel Levi Jones’ 48 Portraits (Underexposed), 2012 at EXPO Chicago Projects. EXPO Chicago will take place from September 22nd through September 25th with an opening vernissage on Thursday September 22nd, from 6 - 9PM. Samuel Levi Jones’ practice stems from an interest in questioning the assumed authority and faultless recording of history in encyclopedic historical material. Jones’ aims to unearth and celebrate those whose contributions and triumphs have been overlooked and left out of the stories that mark our history, the stories of women and individuals of color. 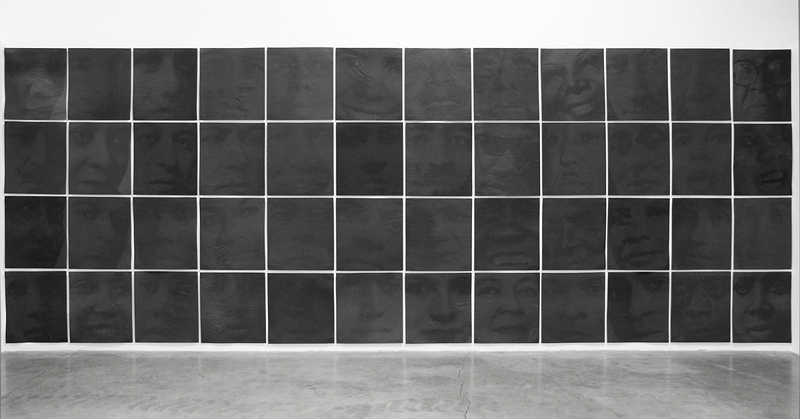 48 Portraits (Underexposed) marks a pivotal point in Jones’ development of his artistic practice. The work is a direct response to Gerhard Richter’s iconic work 48 Portraits created for the German Pavillion at the Venice Biennale in 1972. Richter’s work depicts icons of Western culture and is executed in a large grid of black and white portraits. The individuals depicted include writers, philosophers, scientists and composers; however clearly left out are any inclusions of women or individuals of color. When introduced to Richter’s piece in grad school, Jones’ was initially driven to question why anyone would create a work focused entirely on portraying historical figures of white men solely. Upon further research, Jones learned that the work had been created using the reference of encyclopedias and the images sourced directly from the volume published the same year as the work was completed and exhibited, 1972. Given the growing focus of his work on issues of representation and exclusion within encyclopedic material itself, Jones chose to create a work countering Richter’s by focusing on 48 African -American cultural figures (24 men, 24 women) who could have appeared in the 1972 edition of the encyclopedia but had not: Bessie Smith, Gwendolyn Brooks, Marian Anderson, Nina Simone, Duke Ellington, James Baldwin, Langston Hughes and George Washington Carver among them.